He enjoyed this so much that he kept on asking when and where their next field trip will be. And so the other week, he was so happy to tell me that they will be having their annual field trip on November 29th. 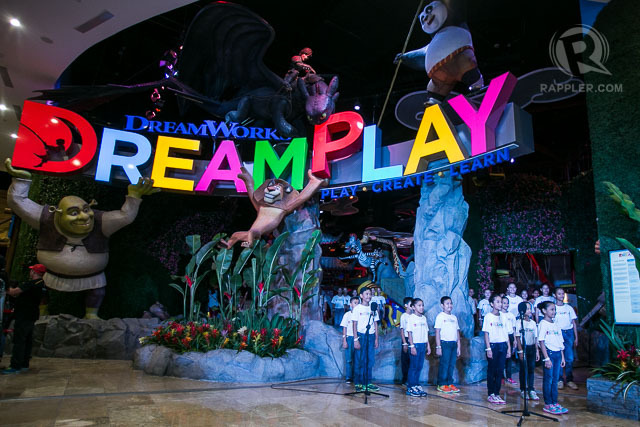 This time, their travel trip is only in Manila to visit Dream Play in City of Dreams. When he saw this photo, his excitement is doubled. He even said that he will definitely enjoy that trip and can’t wait for that day. That’s just one of the three places they will visit. There are two more places, where kids will not just enjoy but also be educated. Travelling is not cheap. So we must look for the best deal of places to visit and the things to do in that particular place. Luckily now, there's Groupon to help us find things to do in a place easier and affordable. 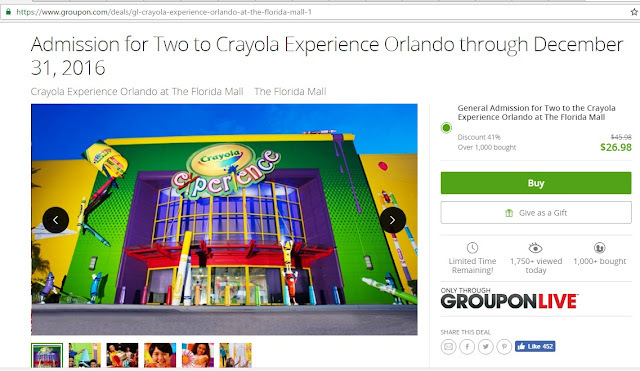 Now, if you are in Orlando you might want to check this Crayola Experience at The Florida Mall. For sure, kids will enjoy this colorful experience with their 70,000 square feet of crayon-themed attractions. Wow, I can’t imagine how happy my son will be in this place. Anyway, you can check Groupon Things To Do in Orlando for other activities or places to visit. By the way, Groupon will not just help you find things to do but also give you the best deal! You save time and money in just a few clicks with their easy to navigate interface. Best thing is, it’s free with no membership fee. Great right? Visit Groupon on Facebook for the latest updates. I love Sunday! Sunday is always for family. I see to it that we spend quality time together. We eat special breakfast together. But last Sunday, Matthew had his last day of examination. Yes, Sunday because this week sem break na nila. Okay lang para matapos na exams niya. Nakakastress kasi we had to review every night, hehe. Anyway, because it's Sunday we went to Church after his exam. 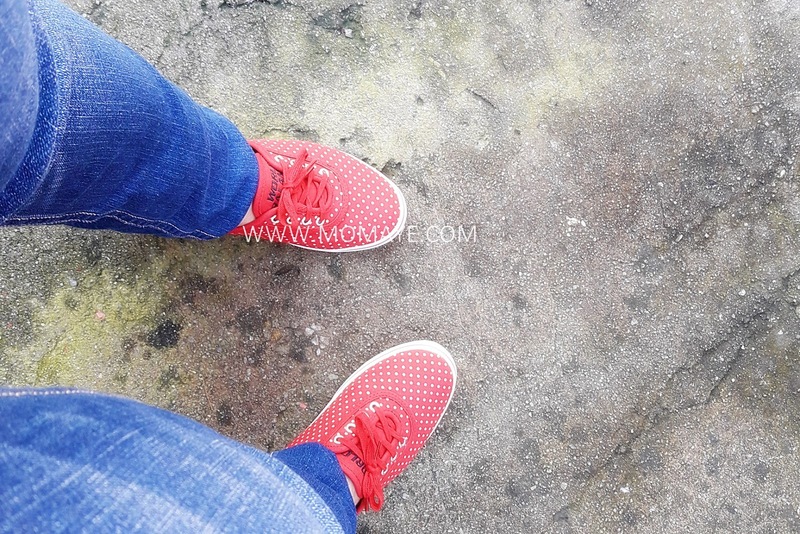 But before I go on, let me show you first my new pair of sneakers from World Balance. Matthew said "wow, polka dots pa talaga mommy", then Daddy said pwede na daw pang-New Year. Mag-ama nga talaga sila, lakas mang-asar, haha! After hearing a mass, we went to SM Marilao. We really don't go that much sa malls unless we have something very important to buy or mag-grocery kami. Our first stop should be Ace Hardware but since I promised to buy Matthew a new set of Cogo we went to the Department Store's toy section first. Guess what, he changed his mind and buy a stuffed toy instead. I'll show you what he bought later. It was past 12 na pala, nagutom na kami kaya we ate our lunch muna. 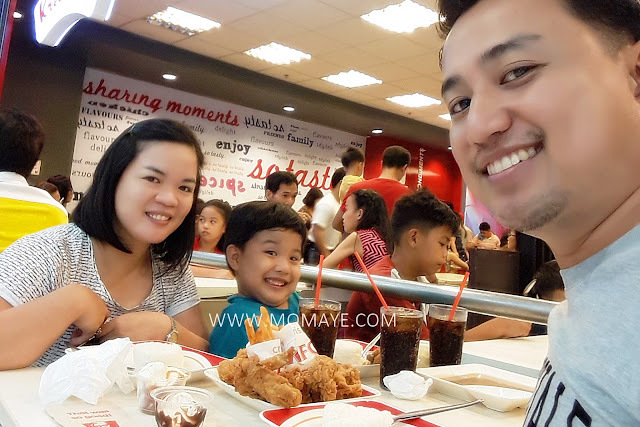 We want to try McDonald's McShare box of chicken but their branch their was under renovation pa so we ended up at KFC, ang fave namin ni Daddy A. Haha. 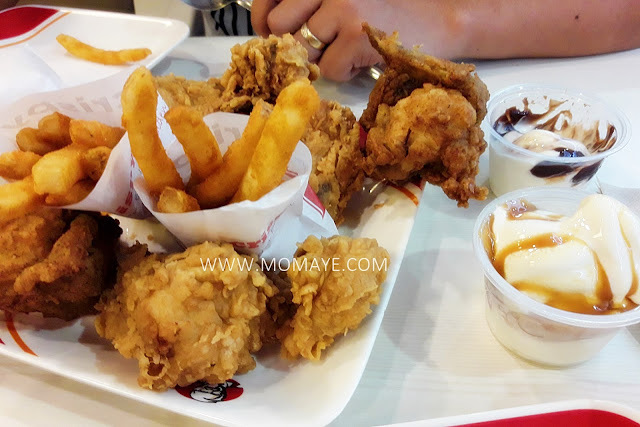 We always order KFCs Street Wise at 419 pesos, good for 3 persons na and sobra pa nga we have take out pa. Daddy added 2 mini sundae, bago yan sa KFC. Masarap sya ha, creamy and milky. We are not really choosy, chicken lang okay na kami hehe. 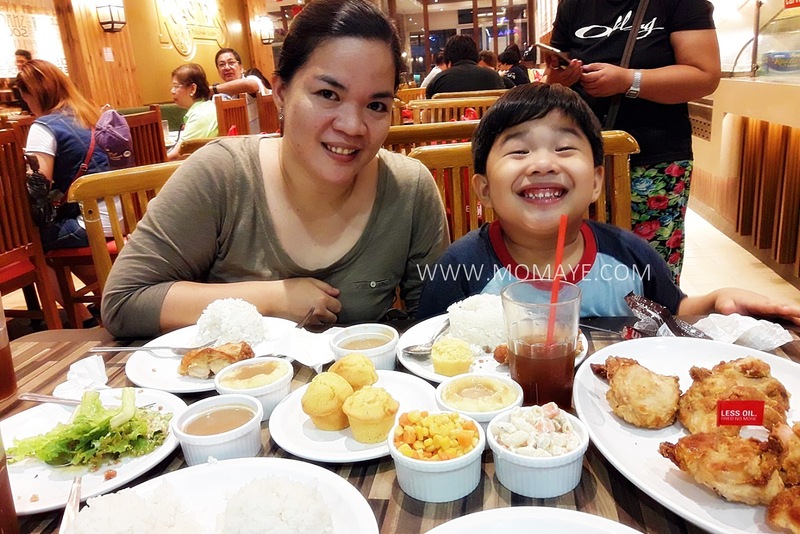 (Read: Our Kenny Rogers Roasters OMG Unfried Fried Chicken Experience) See that cute smile from Matthew? Chubby cheeks showing his dimples. 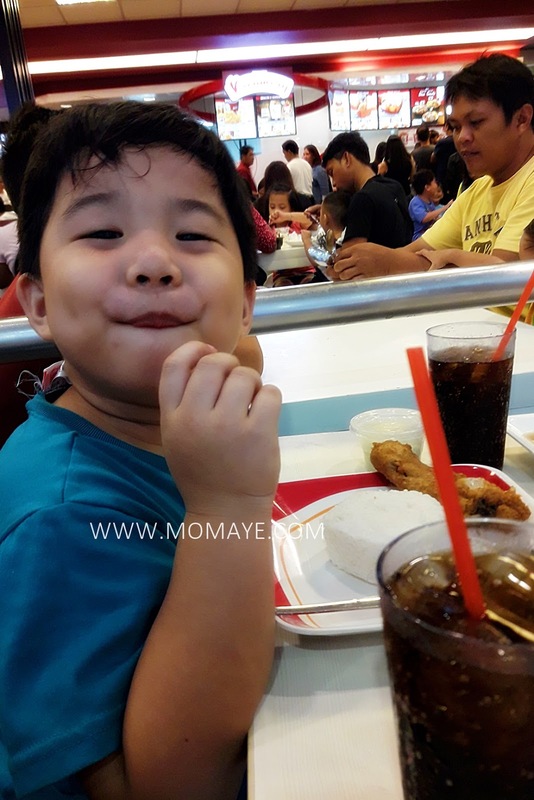 This boy grows so fast that he eats like one big person na. 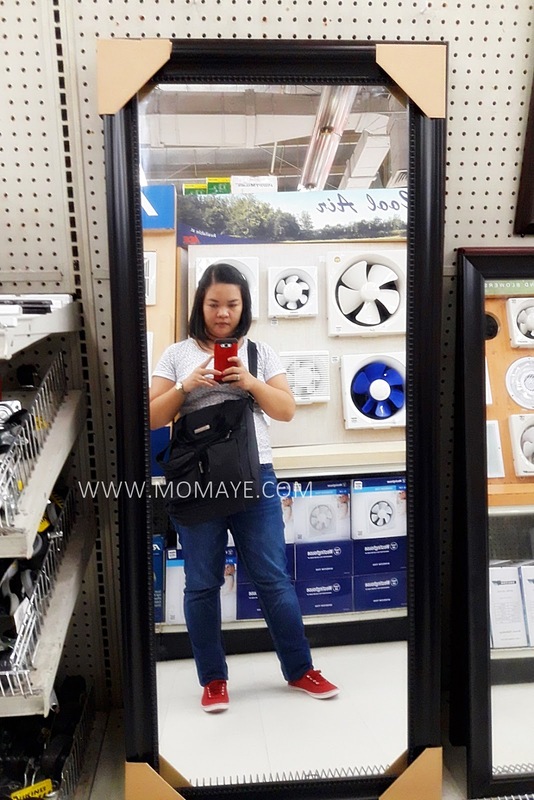 After our full tummy lunch, we went to Ace Hardware. We will start with our home renovation plan. Daddy bought paints and paint tools. 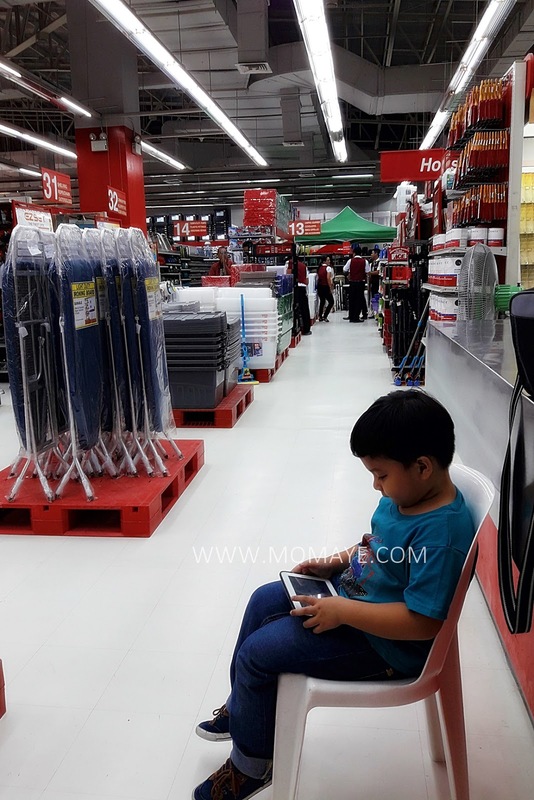 Aside from paints, we had other stuff to buy pa. Good thing Matthew was very cooperative that he said he will just play with his tablet. He was sitting on the floor when a sales lady saw her. She gave him a seat. So bait right? We left him in that spot with the guard around. But syempre I was not comfortable leaving him there so once in awhile sinisilip ko sya. Sobrang nakakaaliw umikot sa Ace Hardware because a mommy like loves home stuff. See those Christmas lights and decors? Next time when our Christmas tree is up, we will buy those. I also love this corner. 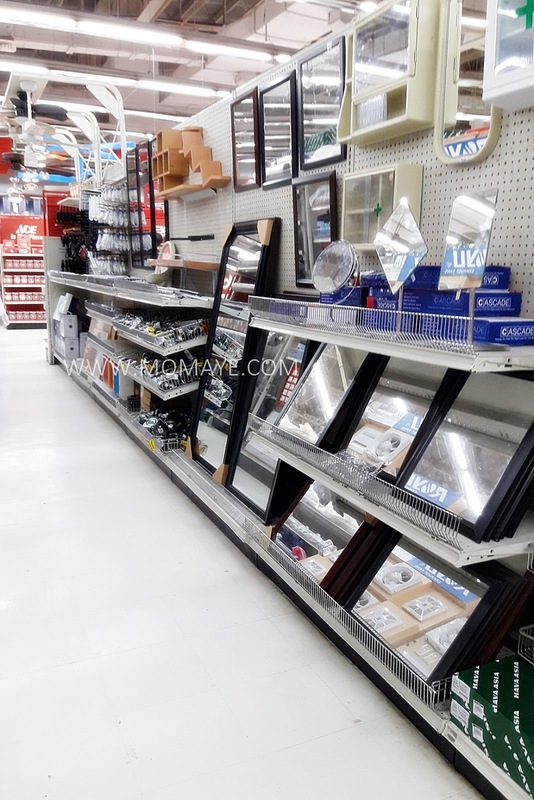 Andito mga mirrors and hanging shelves. 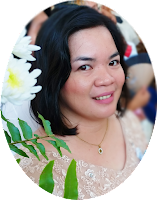 Napapicture tuloy ako that makes me regret seeing I am still fat. Bakit kasi love na love ako ng mga fats na yan. 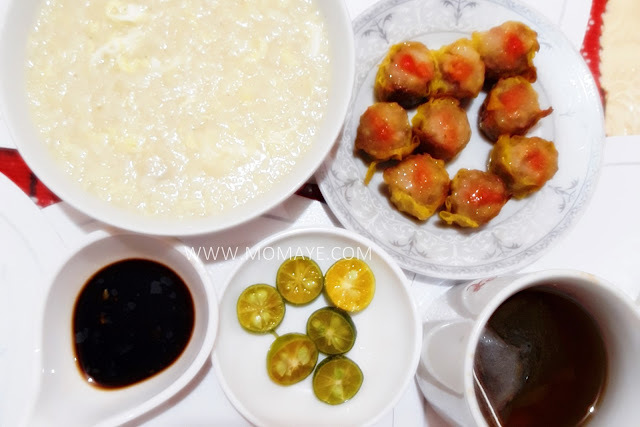 I am stuck at my current weight na. Tamad kasi mag-exercise, hay. Moving on na nga. Daddy bought LED light and padlock then we went to the cashier na. 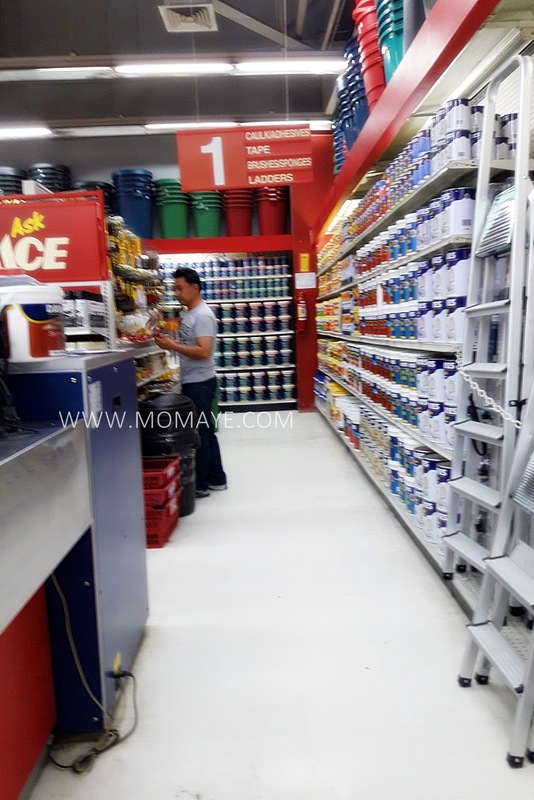 Talagang we stick to our to buy list and after that we went to Hypermarket. Matthew was complaing na ubos na laman ng "tindahan nya." Meaning his food supply, haha. Our mall trip is just always quick. We went home after so Matthew still have time to play outside with his playmates. This has been his routine every day. Before 5 in the afternoon he will go out na. 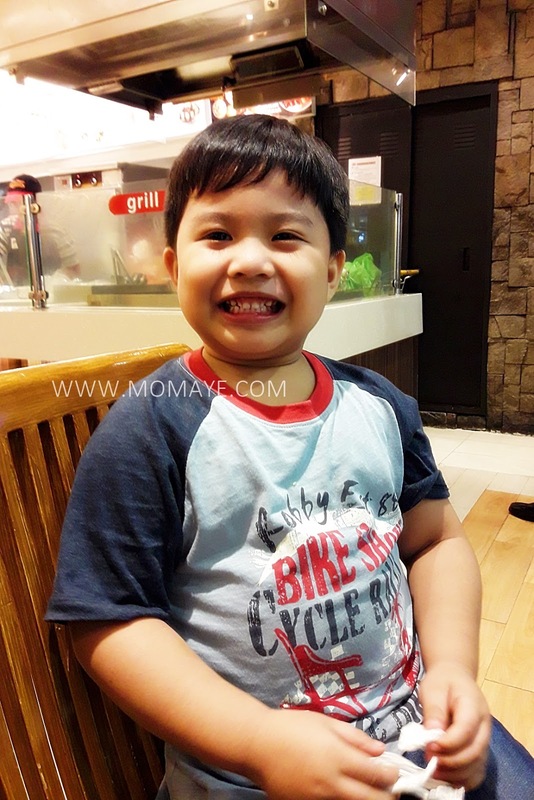 Kahit chubby yan he is very active. He's like nakawalang kabayo sa kwadra sa pagtakbo nya, haha. When play time is over, he will go home, take a rest while talking and talking, and wash time na. Then there's silence. Ganito na eksena kapag Goin Bulilit na. So serious the little boy. 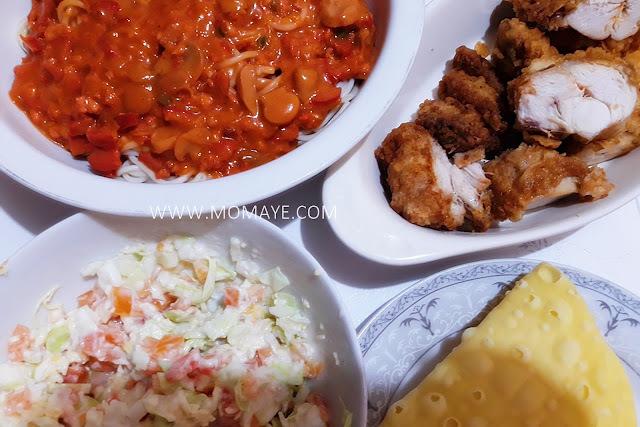 And because it's Sunday, we had our special dinner. My spaghetti, our take out chicken and tacos. 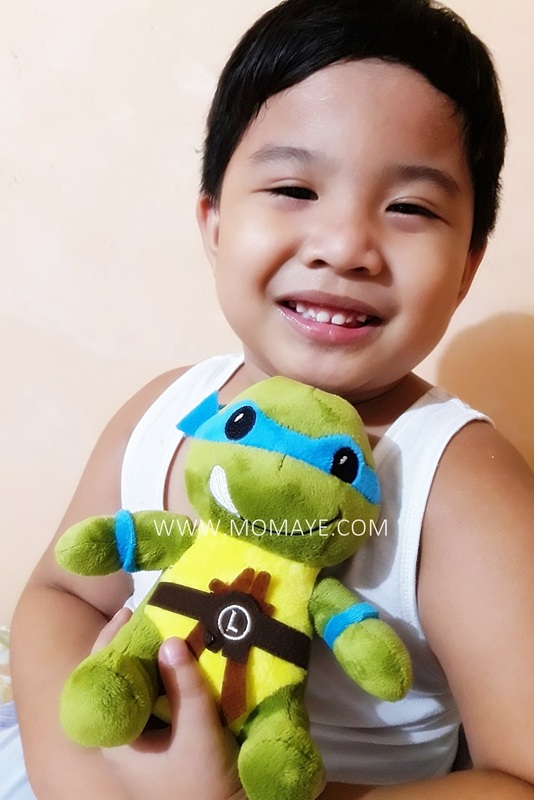 After a busy and tiring day, all I just want to see is this boy's happy smile with his new companion, Leonardo. 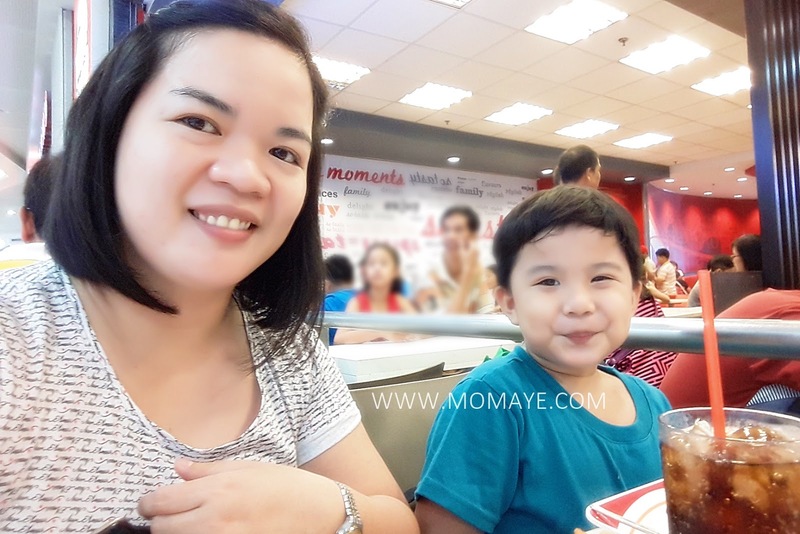 Much more when he told me, "Mommy, ang saya-saya po ng araw na ito! I love you." Just what I need to energize me for another busy work week. When I have learned about Kenny Rogers OMG Unfried Fried Chicken, I told Daddy A that we must try it. However, we avoid dining out as much as we can. Kuripot mode lang, ha ha ha! 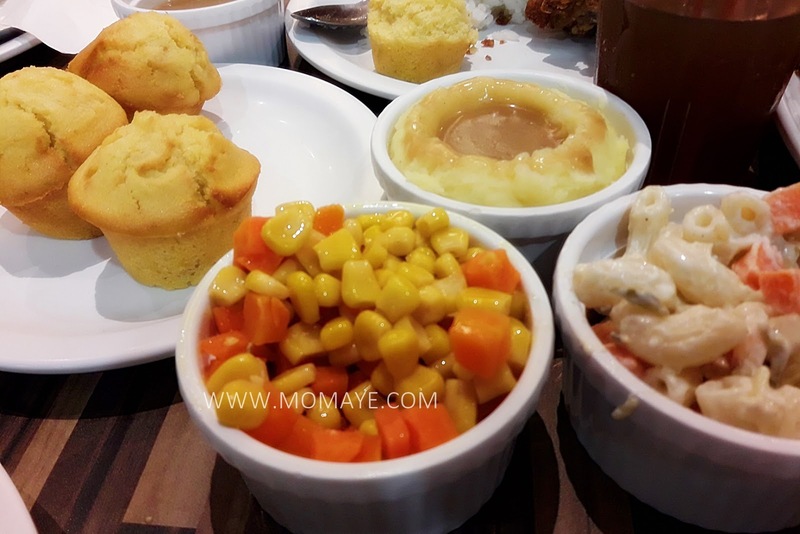 But when we went to SM Marilao 3-day sale a week ago, we were entice to dine in at Kennry Rogers Roasters. Oh that's the table Matthew chose, ayaw nya sa loob. Anyway, we ordered the OMG Unfried Fried Chicken group meal. The group meal includes 8 pcs OMG Unfried Fried Chicken with 4 muffins, 4 rice and regular sides plus a pitcher of soda or iced tea. This group meal is good for 4 persons na but we are only 3. Hindi naman obvious na sobrang happy ang aming bulilit, haha! He loves chicken e and I think OMG Unfried Fried Chicken passed his taste, haha. The chicken has indeed less oil but still juicy. So sorry the photos are not good because our little boy already started to eat even if I tell him I'll took photos first, haha. By the way, the OMG Unfried Fried Chicken group meal is 730 pesos only. 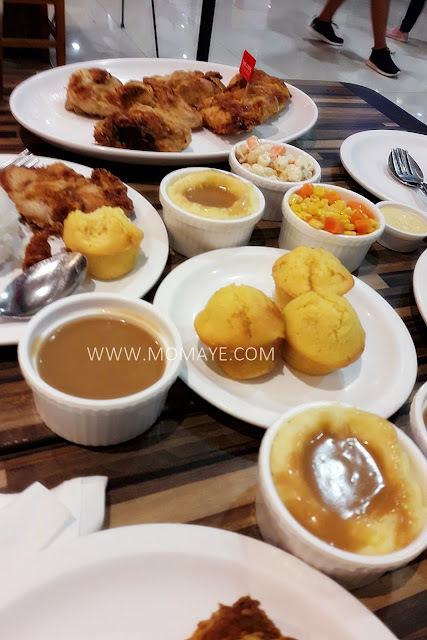 Since it's good for 4 persons or more, we had take outs pa. Sa chicken palang full na kami plus the muffin, and the side dishes are bigger in servings compared to other fast foods. 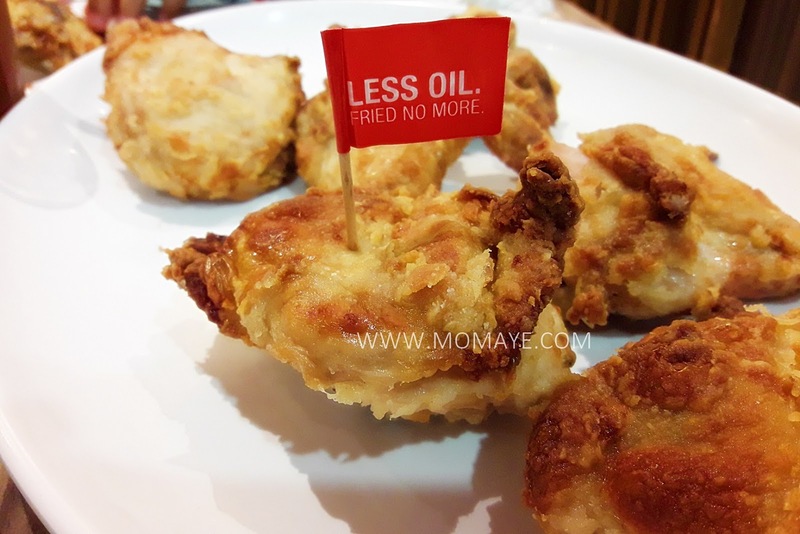 So there you go our OMG Unfried Fried Chicken experience. Full tummy in deed! 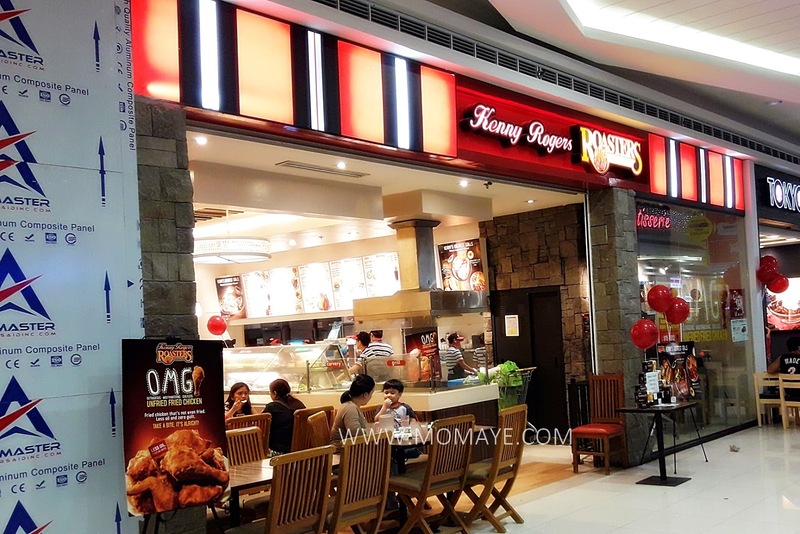 For updates, like Kenny Rogers Roasters Philippines on Facebook. Before Christmas parties, Halloween and Trick-or-Treat parties muna. Last year, Matthew attended his first Trick-or-Treat event. This year I am happy to share that our favorite McDonald's will hold a Grand Halloween Family Fun Day! Kids and the whole family look forward to Halloween year on year because of playful trick-or-treats, creative costumes, and fun activities. 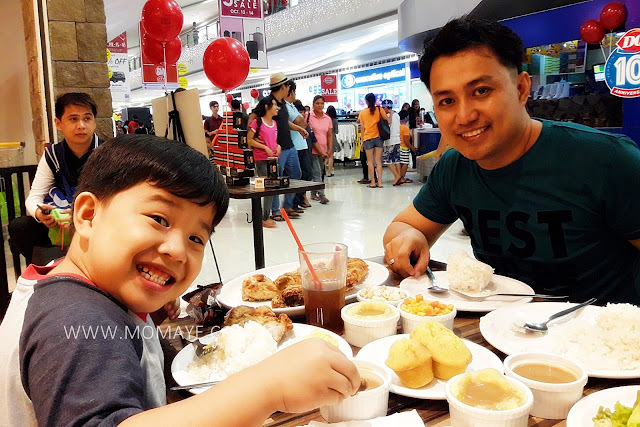 This year, McDonald’s celebrates Halloween bigger as it holds the Grand Halloween Family Fun Day for the second consecutive year in Cebu and for the first time ever in Manila. Kids and kids-at-heart are welcome to join the Fun Day at J. Center Mall, Mandaue City, Cebu, onOctober 22, 2016, and at the World Trade Center Metro Manila on October 29, 2016. The whole family can bond over exciting games and activities such as the Magic Kingdom Show and over their favorite McDonald’s meals during the event. For more details, visit the McDonald’s Grand Halloween Family Fun Day event page for Cebu and Manila on Facebook.com/McDo.ph. Don't forget to share yours and your kids’ eye-catching and spooky costumes and cherished bonding moments by posting them on Facebook,www.facebook.com/McDo.ph, or tagging @McDo_PH on Twitter and Instagram. 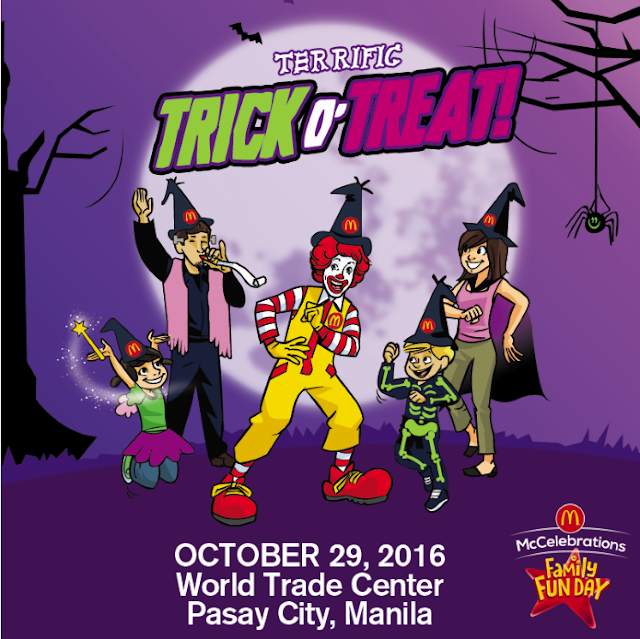 Hopefully, we can attend this McDonald's Grand Halloween Family Fun Day. When can I say "I finally let go"
Hello dearies! How's your weekend? Maulan at mabagyo ba like ours. While Typhoon Karen is leaving another typhoon named Lawin is coming. Sabi nila it's another super typhoon that falls in category 5 like Yolanda. He will hit Northen Luzon again. Let's pray na humina sya. Anyways, I am a bit emotional right now. It must be the weather or it must because its Monday. Hay, the main reason is when this photo appeared in my Facebook timeline. 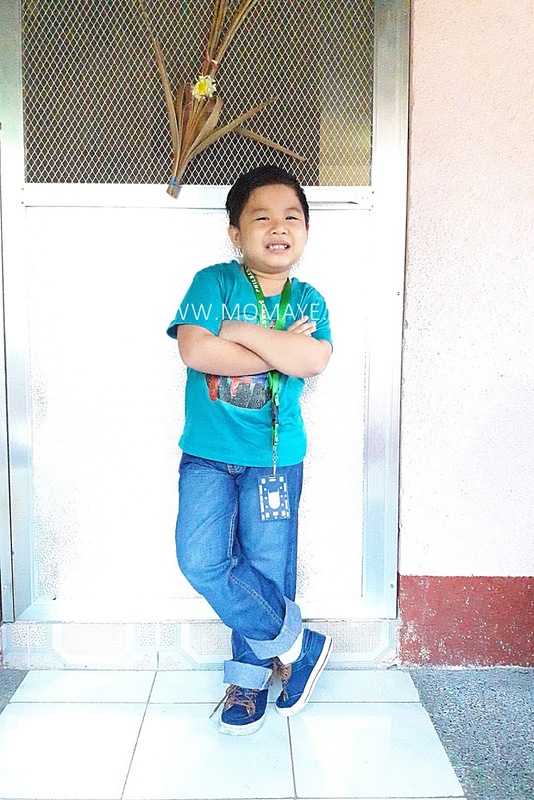 This photo was taken two years ago during Matthew's school foundation day. But this not the reason why I am emotional. This photo. 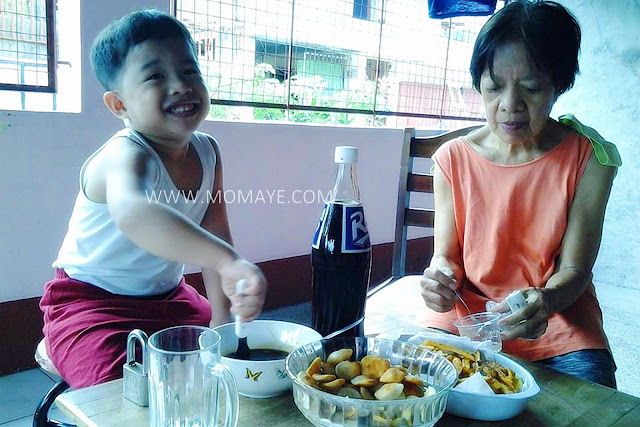 Matthew with Nanay while having afternoon merienda. Two years ago, Nanay was still here with us. And whenever I saw her in photos, I can't help but remember the days when she was already in enormous pain but she kept holding on because I won't let her go. Three months ago, she left us when I finally let her be with our creator. I experienced these twice. First with my father when I talked to God, leaving everything to Him during the time my father was sick. Same scenario happened when Nanay was dying. Ulila na ako, and I will never be complete again. I know I should let go, that most people tell me. But I tell you, it's so hard when there are so many memories to remember. Remembering those memories makes me feel happy and sad. But I can't help it. I am still grieving and praying she will find peace wherever she is right now. Dearies, please pray for my Nanay's soul and please also pray for me so I can finally say "I finally let go." What to Do When Your Child is Being Labeled? As parents we are always trying our best to discipline our children. So when other people labeled our children as a very hyperactive, stubborn or disrespectful child, it really hurts us. For me, no one should call a child as such because this will instill in their minds. But what can we do, not all people can understand our children’s behavior. For a working mom, like me, this is always my dilemma. 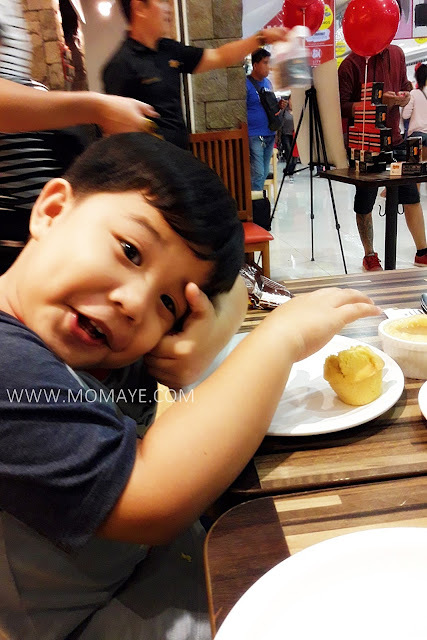 I know I have a good son but when people see him behaving hyperactively, they will call him makulit. I was also hurt when I have learned that he already learned to say bad words. As much as I want to shield him, he’s a school boy already and I am not around to protect him from hearing words he shouldn’t hear and from seeing actions he shouldn’t see. That’s one of my fear and it came too soon. So even if I don’t like it, I have to deal with it. 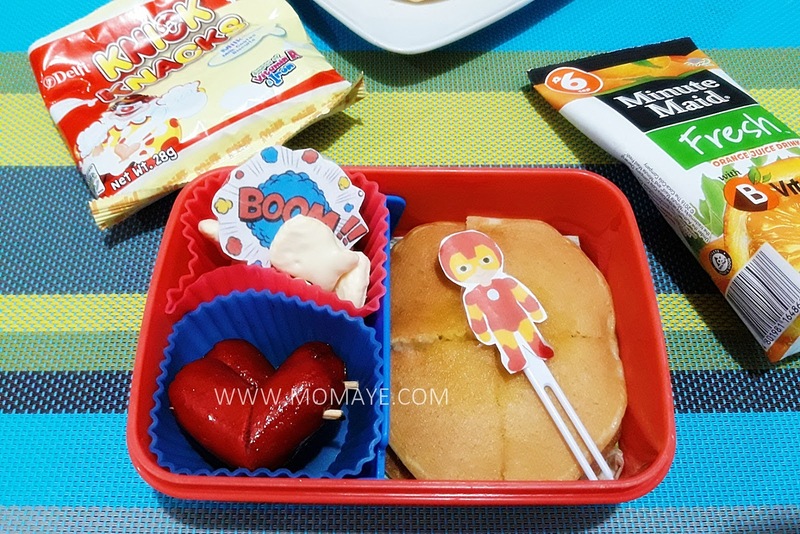 My son is on his third year in school and this year school year, I noticed he’s been very impatient and still hyperactive. I must admit I am full of disappointment that I can’t help but cry and question my ability as a parent. Being a working mom doubles the pain and the guilt I am feeling. And I started to feel a big failure as a mom. 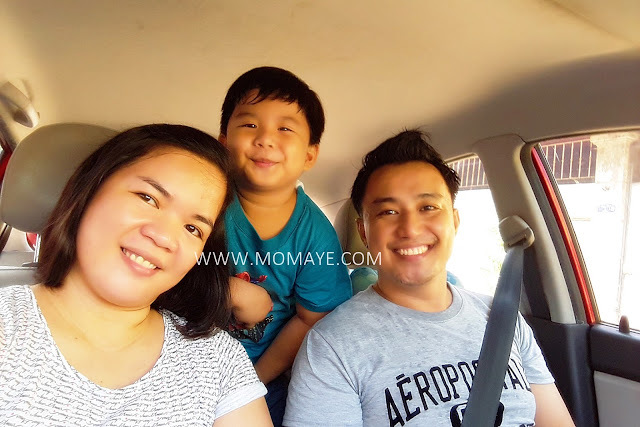 But after weeks of thinking and observing my son, one day I realize that this is just a test and for sure other parents are going through this too. 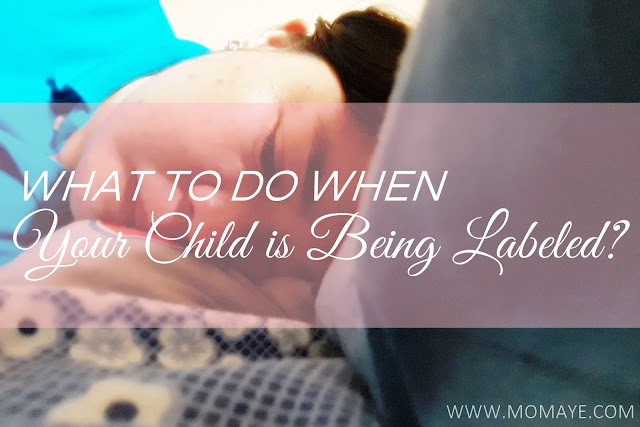 Now, let me share what to do when your child is being labeled. I think this is the very best thing to do first. To stay calm. It’s not easy to not get affected when you hear other people labeling your child. But holding your temper will make you think will and will save you from doing and something you will regret after. The first time I heard about my son’s misbehavior, I was really disappointed for I know I never fail to remind him to behave accordingly. But showing how disappointed I was didn’t help my son. He started to fear my acts and would not say anything. He wouldn’t talk and tell me everything because he knows I will get disappointment or mad. He started to be afraid of me and see as a monster. When I realized that, I try confront my son calmly. As much as I can, I try to mask my feeling of disappointment. So I can hear him well so I can understand where he is coming from. Because I am sure there’s a reason behind that act. Building trust is very important too. Showing our kids that they have us on their back no matter what can help build their confidence and trust on us. They will become more open to you and will not be afraid to tell their mistakes. Our kids are good story tellers. They have good memories too. So always listen to them. Show them you are always concern and you understand them. Good or bad, just listen. When they are done, ask them to listen too. Remind them that every act has its consequence and you don’t tolerate such. I tried punishment on my son. It’s more on physical punishment but whenever he was hurt, I get hurts a hundred or more times. It’s very heart breaking to see your child hurt in your own hands. So I promise I will never do it again. So I think of a more peaceful way to discipline him. I list down rules that he must follow. I let him read that and told him that when a rule is twice broken he will have its consequence on the third offense. He agreed and I printed a rule chart for each week on which he will put a smiley if he obeyed, and sad face if he broke the rule. He was delighted with the idea and whenever he’s misbehaving, I just remind him that he will have a smiley on his rule chart. I just hope he will also remember these rules when he’s at school. We are our children’s first idol and whatever we show them, they will surely copy that. If you have a helper or nanny at home, try to talk to them as well. Show them your rules and tell them to be a good example to your children as well. Based on my experience, our little learned to say bad words from our previous helper. My son even said she cursed him, which made me furious. That's why when she draw the last string of my patience, I didn't think twice and let her go. God is always good, He sent a replacement much better than her. Hopefully she will stay longer and be a good example to our son as well. Lastly, don’t get tired of our kids because we parents never get tired no matter what. Being a parent is a challenging role. So we must not let such situation make us a monster who is full of hate and depression. Rather turn the negative situation into a positive one for God will never give us anything we can't handle. Give our kids more time and love because they deserve all that we can give. Would love to hear your stories too. Please don’t hesitate to share yours in the comment box. Thank you! by Mommy Maye Labels: child discipline, Confession, parenting, Parenting Tips, What to Do When Your Child is Being Labeled? 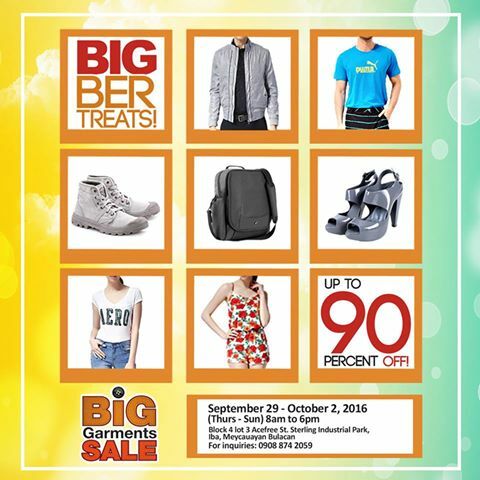 We always look forward to Big Garments Sale. 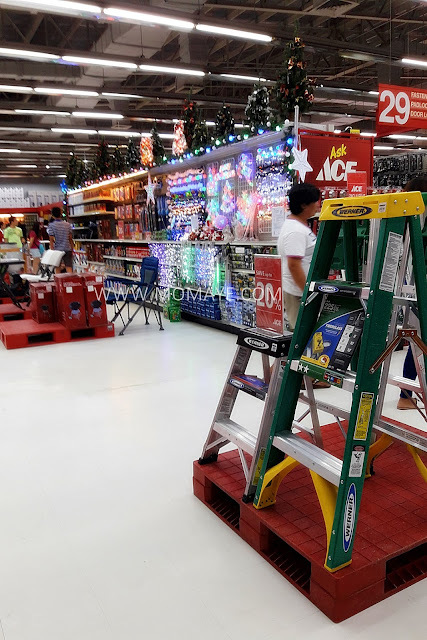 Usually, mga 3-4 times a year sila kung mag-sale. Last September 29 to October 2, 2016, nagsale sila ulit. Up to 90% discount on branded apparels, footwear, fragrance, toys and more! As I have said, we always look forward to this sale. There are so many good finds. Mostly imported and authentic items that are way cheaper than the mall price. Share ko lang our October sale loots. 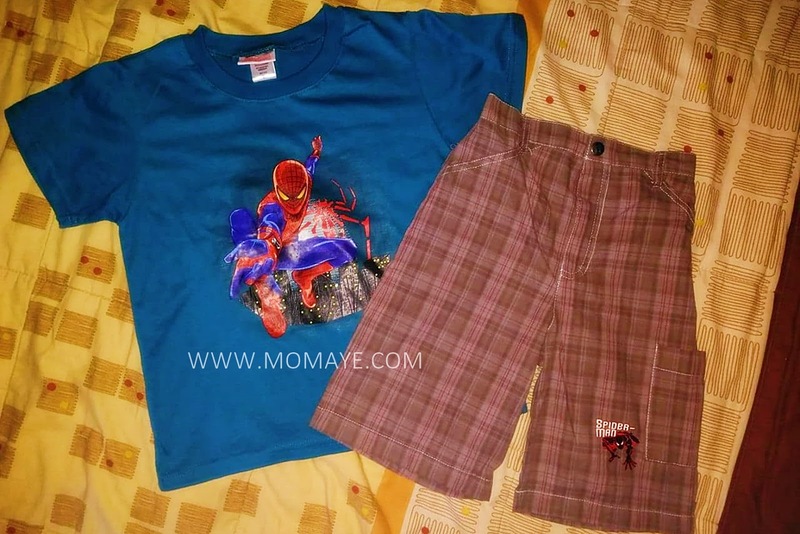 This pair of shirt and shorts for Matthew is only 250.00 pesos. 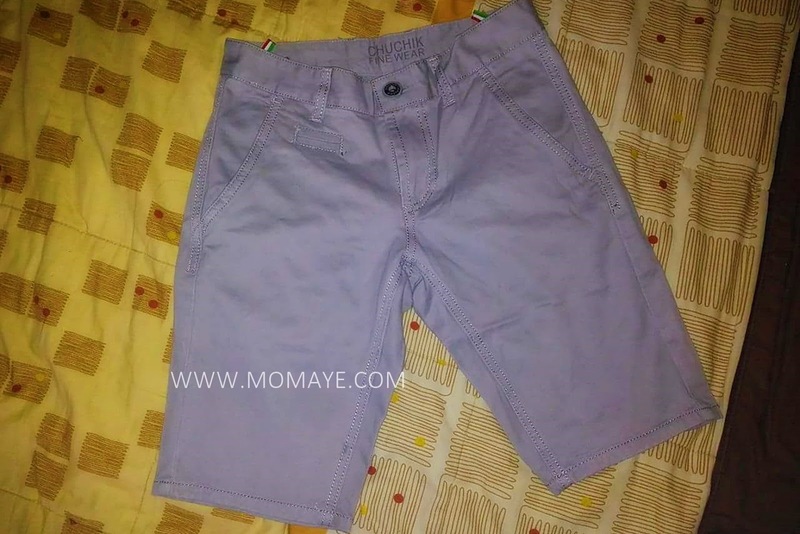 This pair of shorts for kids naman is 350.00 pesos. 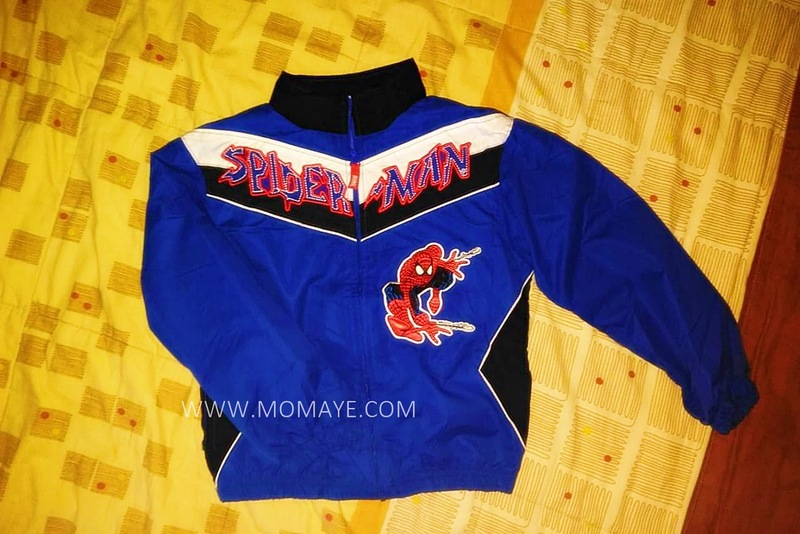 This Spiderman jacket naman is 350.00 pesos. Heto naman for me is only 250.00 pesos. 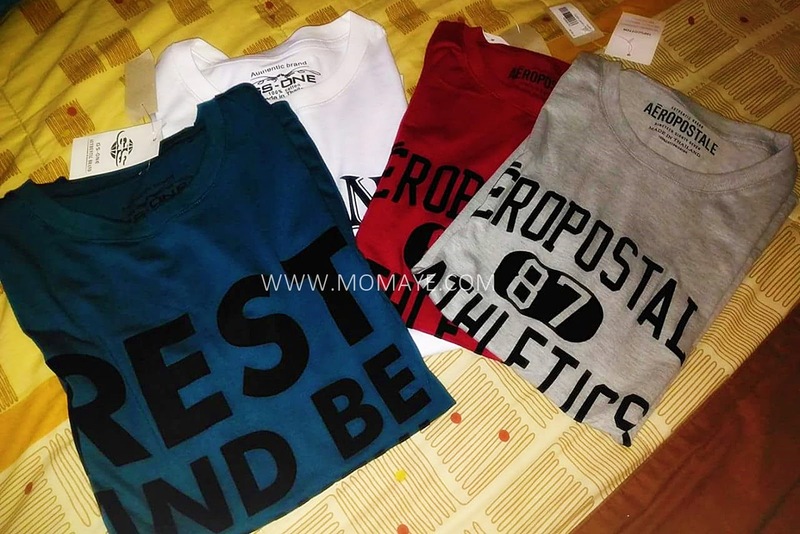 These t-shirts (Aeropostale and GS-One) for Daddy A is 150.00 pesos each. 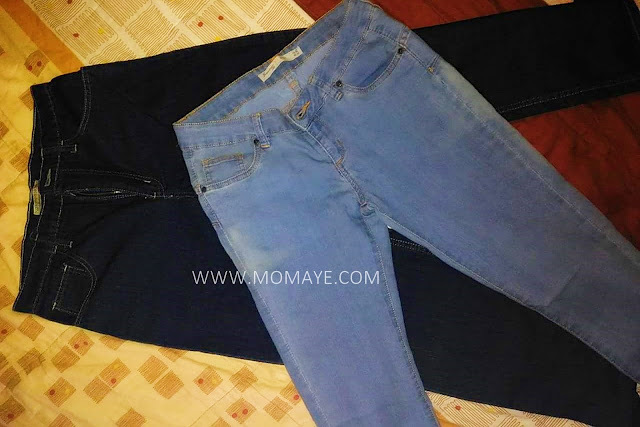 These two pairs of pants for Daddy is 225.00 pesos while for me is 275.00 pesos. 50% off sya. 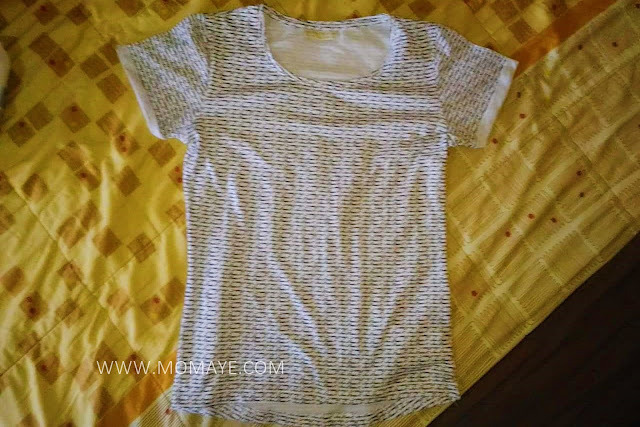 These 3/4 shirts is 200.00 pesos only, buy take one pa. And nice ng fabric nito, promise. Hindi mainit sa katawan. 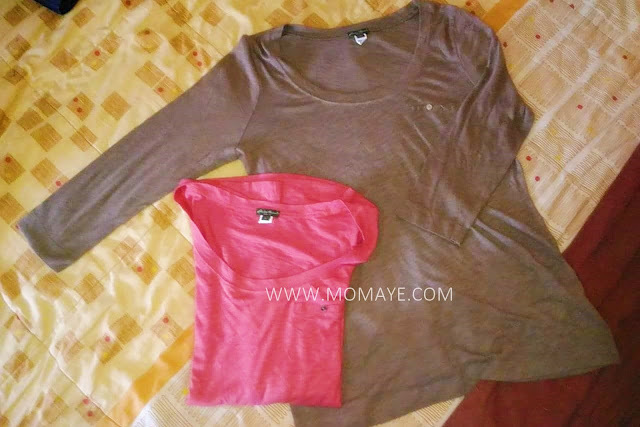 These items are on sale too. 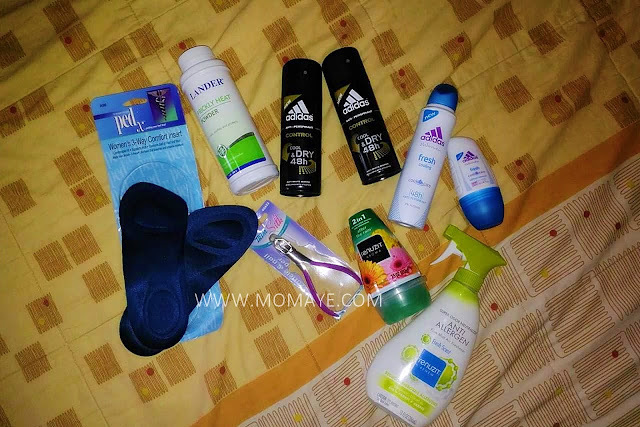 The PedX Women's 3-Way Comfort Insert is only 50.00 pesos, Lander Prickly Heat Powder is 75.00 pesos, the knipper is 50.00 pesos, Renuzit aroma is 40 pesos, Renuzit anti-allergen spray is 80 pesos, Adidas spray for men is 75.00 pesos each, Adidas spray for women is 50.00 epsos and Adidas anti-antiperspirant deo is 20.00 pesos. Good buys na talaga kasi if you go to mall baka 2 times ang price ng mga yan. By the way, they accept all major credit cards :) So see you in their next sale ha? To get updates like their Facebook page: www.facebook.com/BigGarmentsSalePH. Sobrang bilis naman ng araw and for all we know it's Christmas na. But before we celebrate Christmas, there's one holiday/event that we Filipinos celebrate. That's All Souls Day or Araw ng mga Patay. 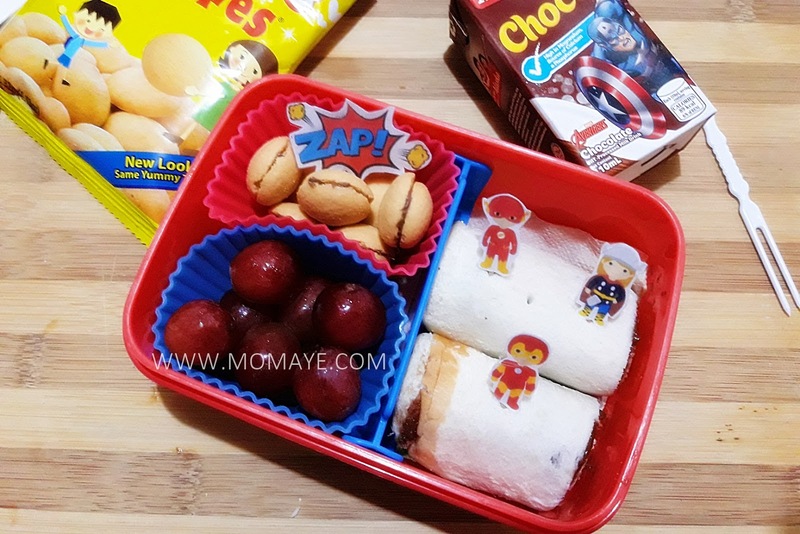 For kids and kids at heart naman, there's Trick or Treat or Halloween Party that happens usually on the 31st of October in different Malls and Hotels nationwide. 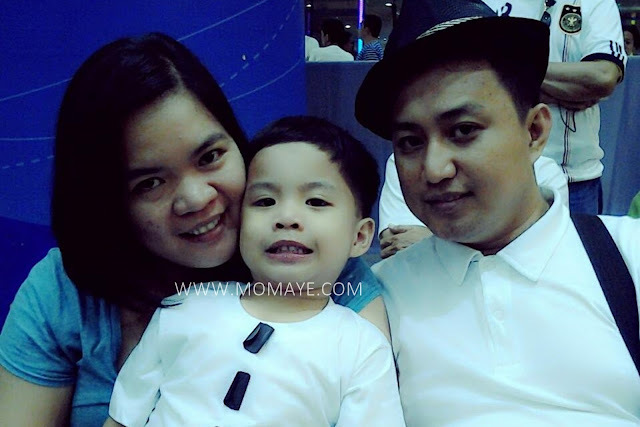 Last year Matthew attended his first Trick or Treat event at Walter Mart Sta. Maria. 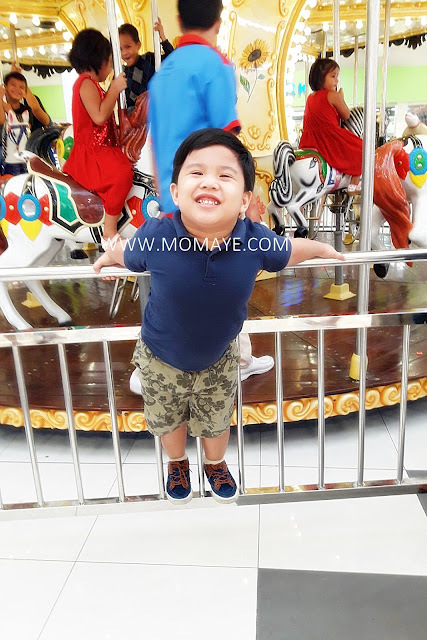 Nag-enjoy sya ng bongga because of the candies he collected from selected mall stalls. This year, I am not sure if he'll be able to attend such event because we'll be going to Nueva Ecija. Speaking of Halloween, I have a creepy kwento from our new kasambahay. Yes, we already have one kaso lang mukhang may third eye sya. Based sa kwento nya, it's not the first she encountered ghost. Yes ulit my dearies, may ghost daw sa bahay namin. Kinalibutan talaga ako sa kwento nya. I asked her one time kasi bakit hindi sya nagpapatay ng ilaw. Sabi nya may humihila daw ng kumot nya. Yaiks! Kakakilabot talaga. 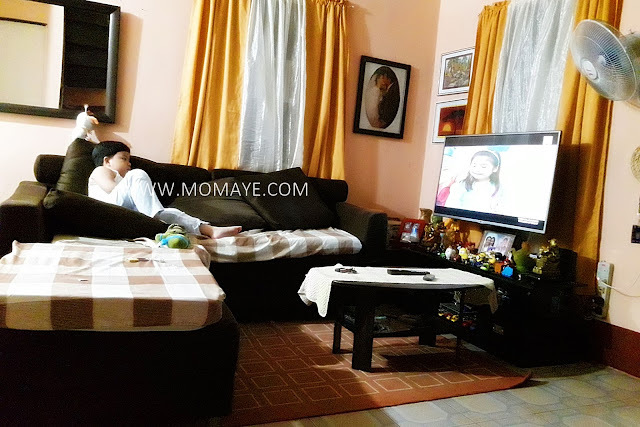 Naisip ko si Nanay ko kaya since doon sya natutulog sa room nya dati. But since Nanay left us wala naman kami naramdaman except during her 40 days when for the longest time, I heard the dogs of our kapitbahay howling. Again, nakakakilabot talaga when I heard that. She might left us already. But I would like to think na sya na rather than another spirit. Dahil nga sa kwento na yan, and she admitted naman na lapitin sya, natatakot ako baka naman sabihin nya may katabi na akong hindi ko nakikita. Haha! Seriously, we needed help on this. 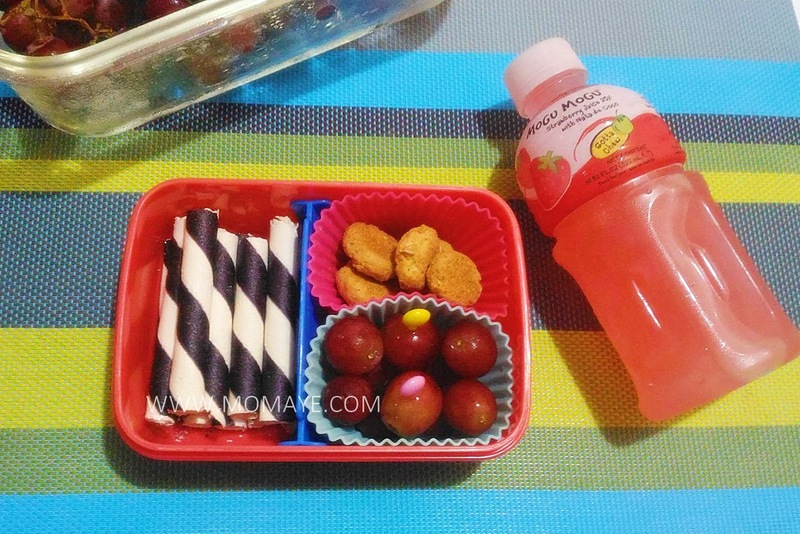 Nababagabag ako e.
Anyways, bento baon muna tayo. 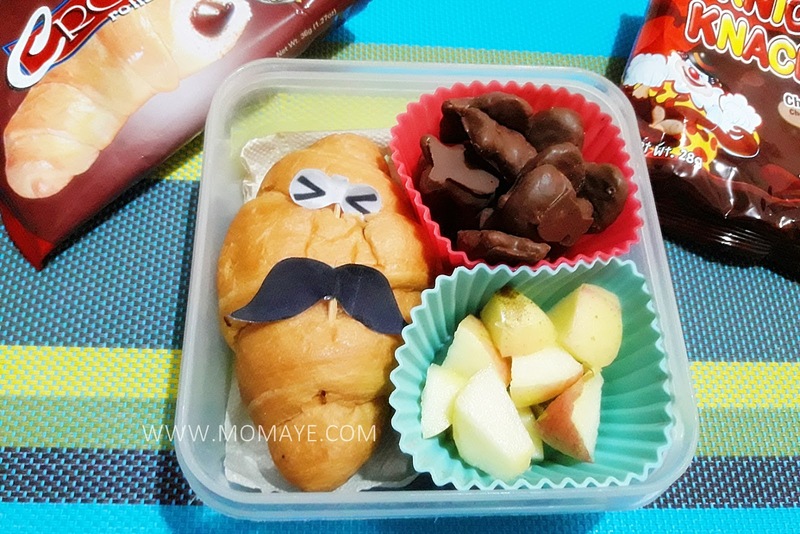 #mrsgoodmancrossiniroll, #knickknacks choco chips and appli slices. 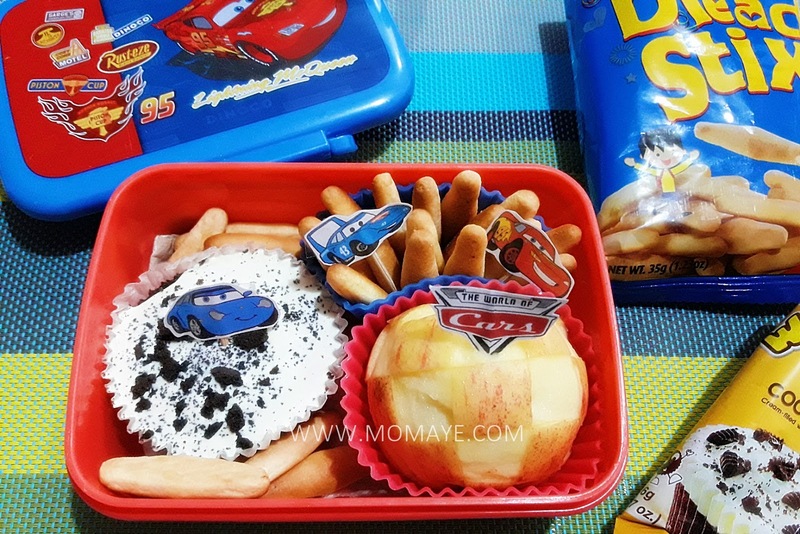 #whattatopscookiesandcream cupcake,#nissinbreadstix with #goyachoco dip and apple. There you go. 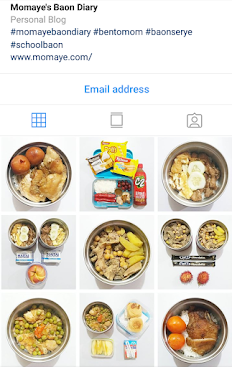 Medyo matagalan ulit bago ako magpost ng bento baon. Marami kasing ganap sa buhay kaya naging busy aside from Matthew's school foundation day.